In 1851 the largest number of Rowdens in one parish is found in Seasalter, Kent. These pages provide some insight into the numbers and distribution of Rowdens (and Rowdons) found in the UK census during the period 1841 to 1891 and 1911. The census returns for 1901 is in the public domain and I have most of the Rowden records for it, but not yet the complete set. However, 1901 will be added in due course; along side other research it takes me about six months to cover each census. The UK pages currently include England, Wales, Isle of Wight, Isle of Man and the Channel Islands. Scotland will be included when time allows. The Republic of Ireland seceded from the UK in 1922, but Northern Ireland remains in the UK. Most records relating to Ireland prior to 1901 are lost, having being destroyed by fire. 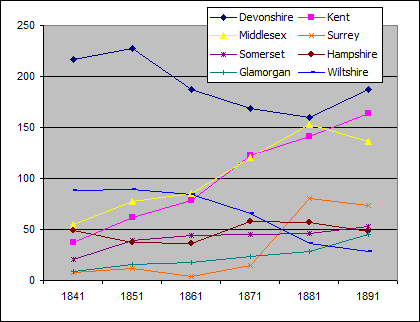 For more detail about the UK census records click here. Records from the US and Canada cover different periods. The US records available in the public domain cover every 10 years from 1800 until 1911 and those in Canada, from 1861 every 10 years until 1911, although these vary from state to state. At the moment an overview of these is not available from the website but will be included in due course when time permits.